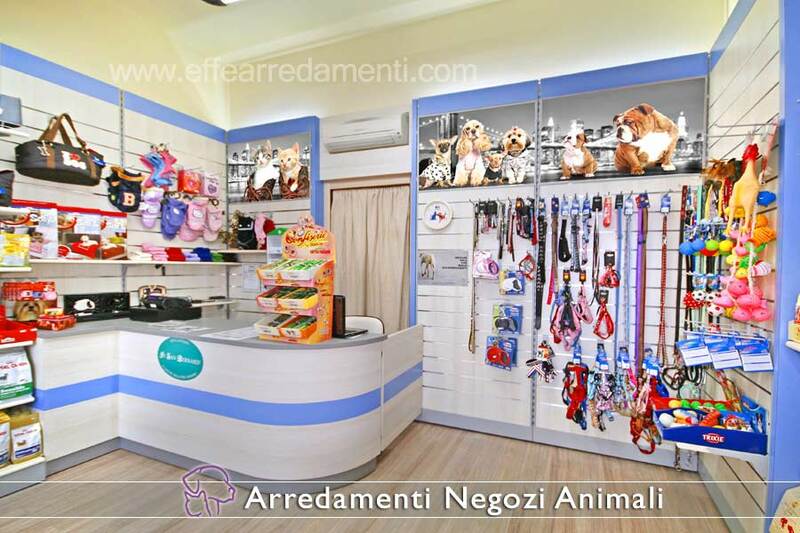 Effe Arredamenti specializes in design, production and installation of all the necessary furniture for pet shop shops and points of sale of products for animals (dogs, cats, rodents, birds, fish, reptiles, etc.). 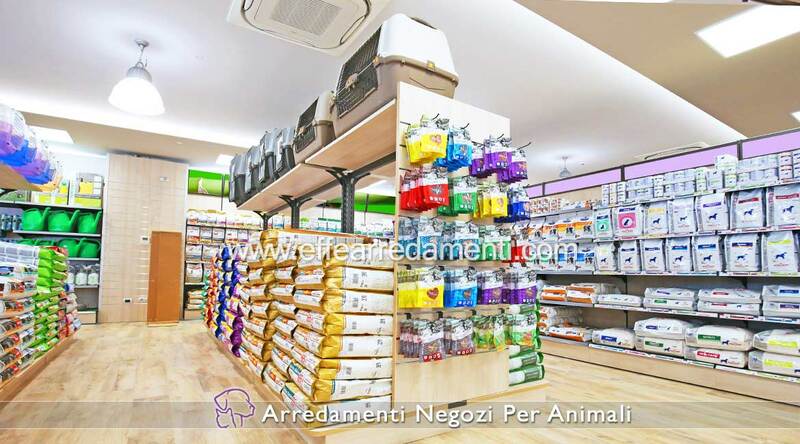 The company, leader in the sector, has perfected over time systems of modular furniture for animal shops increasingly efficient, functional and suitable for the promotion, exposure and classification of all specific products for the care of animals, clothing, food, snacks, kennels, baskets, beds, leashes, collars, scratches, pesticides, cages, games, bowls, grooming, repellents, deodorants, etc. We supply the wall units, the central elements, the gondolas, the drawers, the windows for the products you care about and much more. if devi Furnishing a pet shop or pet shop, or open or renew do not wait, contact us! Come and visit the showroom! We invite you to visit the showroom at the company by making an appointment or simply passing by "touching" the products, the materials, the combination of the colors, the systems used, the ideas, the best solutions to realize thecomplete furniture for your new pet store. You can choose the best balance between functionality, practicality, innovation, quality and savings. 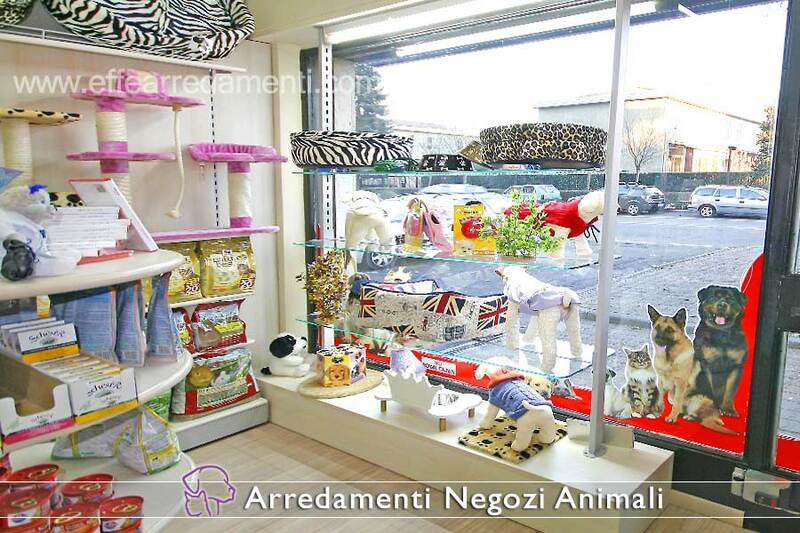 Photo n. 001 - Gracious furniture for pet products shop in Milan, with 35 square meters available, plus grooming. Existing shop completely renovated and designed down to the smallest detail to meticulously respond to all the specific requests of the client, who for years now knows his sector well. In the photo, starting from the right: showcase display with height-adjustable led glass shelves, self-supporting gondola peninsula with straight and circular wooden tops in the headboard, walls equipped for display with colored finishes, custom-made cash desk with decoration , illuminated decorative prints. Complete set-up of furniture and also of wooden floor. 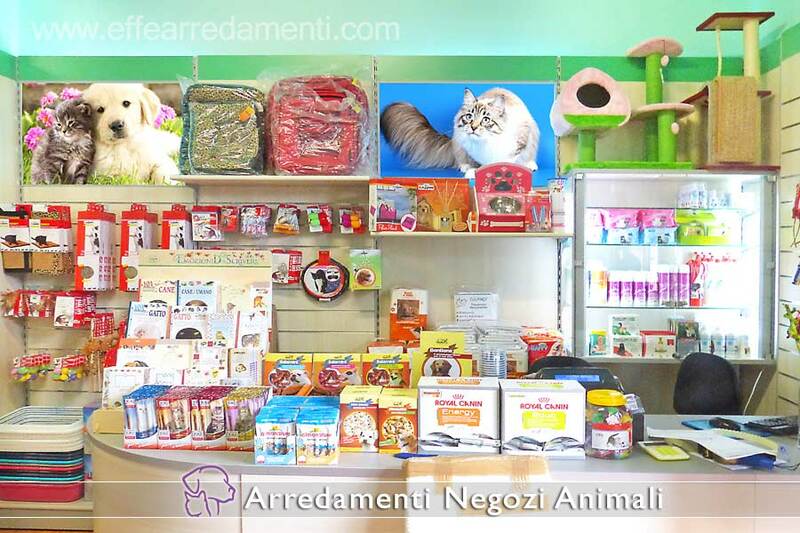 A small but pleasant shop specialized in articles for animals. 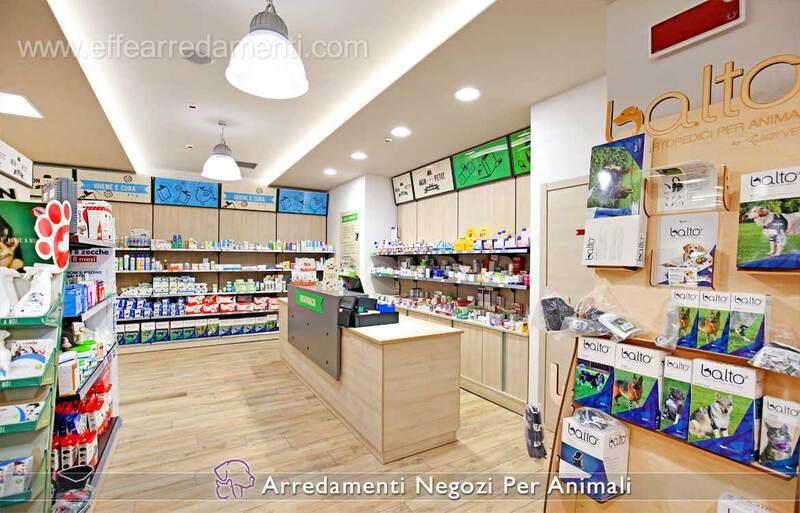 Photo n. 003 - Perugia, in an area of ​​800 square meters, Effe Arredamenti has created this pet products shop, in the picture shows the furniture for the pharmacy area of ​​pharmaceutical products for animals. Photo n. 004 - Effe Arredamenti has furnished and set up on the site in Rome, in a space of 500 square meters, this shop of products for animals. As is our custom, we have optimized the sales area considering, as far as the shelves are concerned, the weight, size and shape of each exposed product, placing it on the shelves in an optimal way. Photo n. 006 - As you can see in the photo, the furniture of this shop is modular, with hooks and shelves adjustable for the display of accessories for your animals. 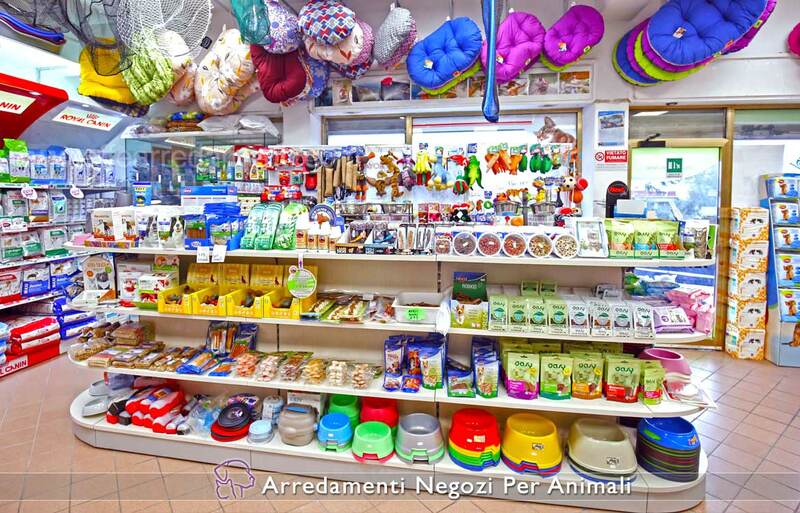 An indispensable department to satisfy the demand of your customers more and more attentive to the needs of their four-legged friends. Photo n. 010 - In this photograph, you can directly tell how Effe Arredamenti has succeeded in enhancing this Pet Shop with functional display structures that are technically made to perfection. Photo n. 020 - In photography the furnishing of the supply department with Shelves both in wood and in metal for the display and sale of food for animals, ceilings with the image of animals. This shop was made in Perugia. See the other photos on this realization! 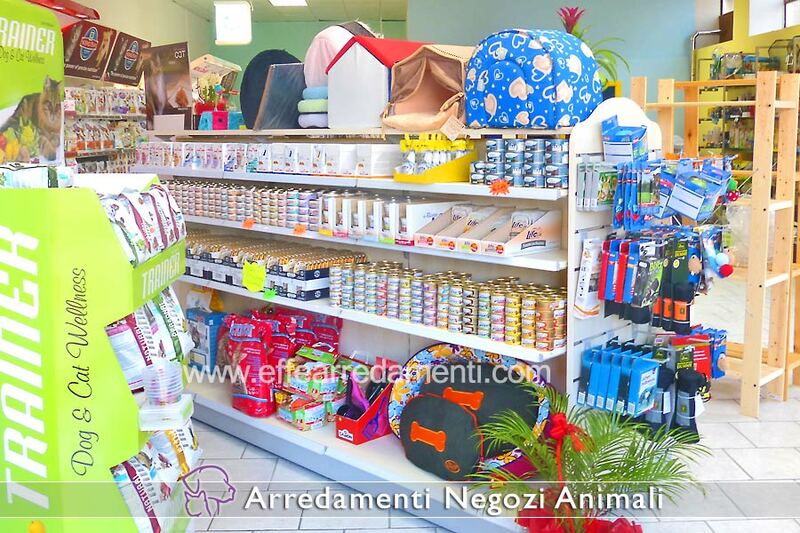 Photo n. 025 - Effe Arredamenti has created for you this furnishing system, ideal for displaying animal feed bags, with a gondola composed of a bilateral melamine maxi base and an upper display gondola top. Photo n. 030 - Effe Arredamenti has realized, in the photograph in detail, the cash desk with the fan-shaped door with closing, the wall for the display and sale of clothing for animals, snacks, leashes and accessories. Photo n. 040 - In photography in detail, the furnishing of the showcase for the display of articles for animals, composed of base platform, adjustable glass shelves with led lighting. All in the best furnishing tradition of Effe Arredamenti. Photo n. 043 - The functional furniture through which the space is divided into two areas: a retail area for products for animals, another exhibition area with birdcages. Photo n. 044 - In photography, the furniture and fittings on the site of a 60 square meter store for animals made in Bologna. In the foreground the supply department. 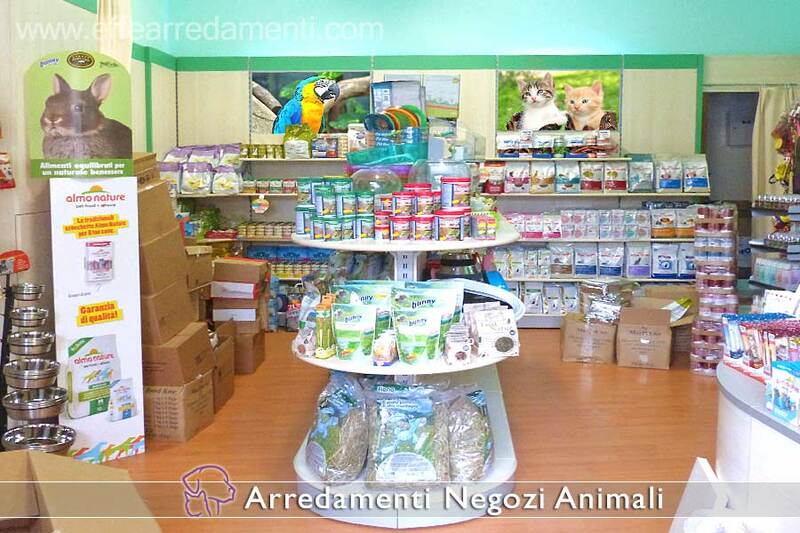 Photo n. 044 - We also wanted to show you this pet shop, even when loading products, made by Effe Arredamenti in Rome. 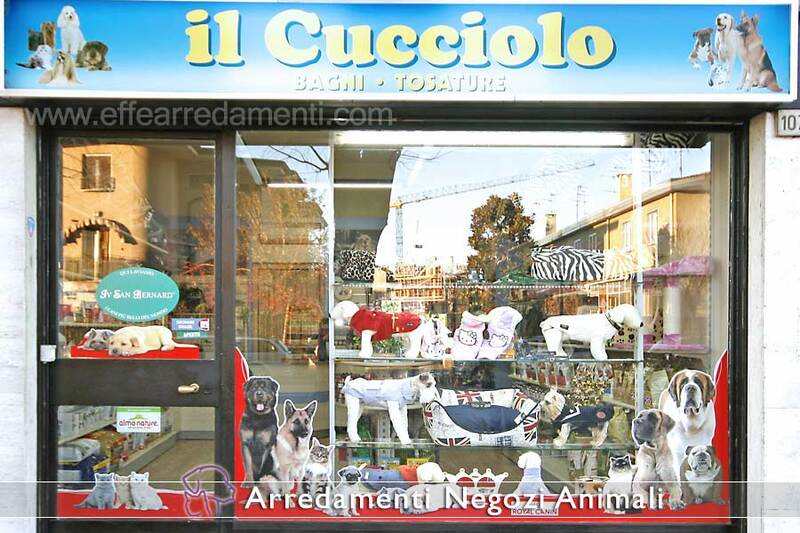 Photo n. 045 - In Turin we have realized e furnished this pet shop on an area of ​​70 square meters. Note the curved structures in the background to adapt the furniture to the structure of the store. 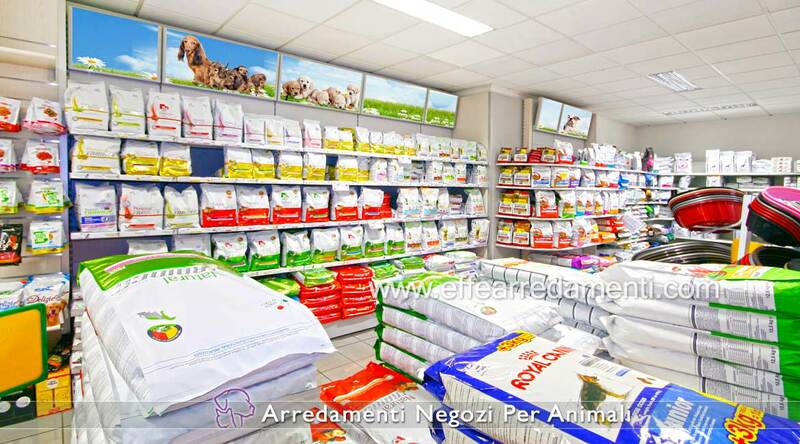 Photo n. 048 - At Cattolica Effe Arredamenti has created this pet shop on an exhibition area of ​​55 square meters. Note the decorated structure in the foreground and the carefully equipped corner in the background. Photo n. 049 - In this photo snapshot, the cash desk plus the back complete with fitted wall and an illuminated display element for the exposure of pesticides and products for animal hygiene. The shelves that you see on your left are adjustable, in the same way as the hooks. Note the backlit decorative images. Photo n. 050 - The window seen from the outside of a pet shop that Effe Arredamenti has made in Cologno Monzese. Photo n. 060 - Modular gondola with heads for the display and sale of snacks and animal feeds. Photo n. 070 - This particular structure with wall uprights and glass tops, was created by Effe Arredamenti for the display and sale of accessories for animals and cages for rodents and birds. Photo n. 080 - With Effe Arredamenti the corner of your shop is maximized. 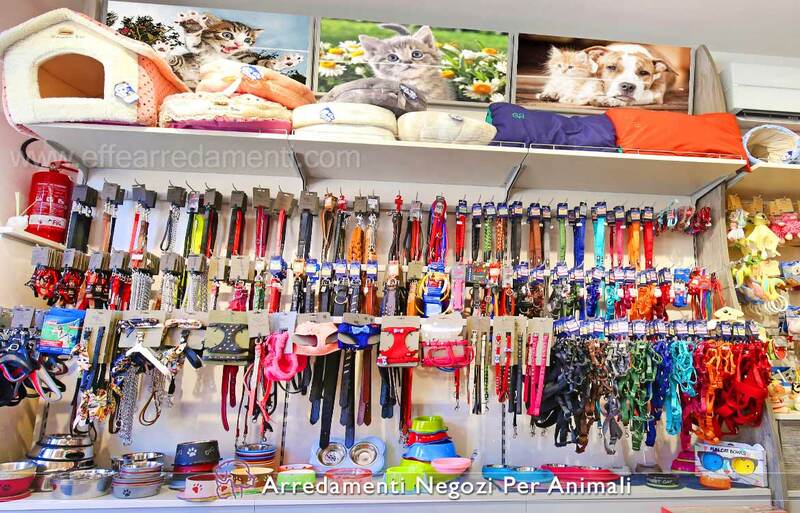 This angle was equipped for the display and sale of accessories and leashes for animals, arranged on 3 depth levels, and was created by Effe Arredamenti in Perugia. Photo n. 090 - Bilateral exhibition gondola made by Effe Arredamenti for the display and sale of kennels and animal feeds.